The Christmas Masquerade by Mary E. Wilkiins Freeman is about children who get "stuck" in their holiday costumes and become the characters they were only pretending to be. What will their parents do? This would be a good story before Halloween as well, published in Freeman's The Pot of Gold in 1892. [Vocabulary note: "miauled" means "meowed" but sounds more like the sound a cat actually makes]. On Christmas Eve the Mayor's stately mansion presented a beautiful appearance. There were rows of different coloured wax candles burning in every window, and beyond them one could see the chandeliers of gold and crystal blazing with light. The fiddles were squeaking merrily, and lovely little forms flew past the windows in time to the music. Of course there was great excitement among the regular costumers of the city, and they all resolved to vie with one another in being the most popular, and the best patronized on this gala occasion. But the placards and the notices had not been out a week before a new Costumer appeared who cast all the others into the shade directly. He set up his shop on the corner of one of the principal streets, and hung up his beautiful costumes in the windows. He was a little fellow, not much bigger than a boy of ten. His cheeks were as red as roses, and he had on a long curling wig as white as snow. He wore a suit of crimson velvet knee-breeches, and a little swallow-tailed coat with beautiful golden buttons. Deep lace ruffles fell over his slender white hands, and he wore elegant knee buckles of glittering stones. He sat on a high stool behind his counter and served his customers himself; he kept no clerk. It did not take the children long to discover what beautiful things he had, and how superior he was to the other costumers, and they begun to flock to his shop immediately, from the Mayor's daughter to the poor ragpicker's. 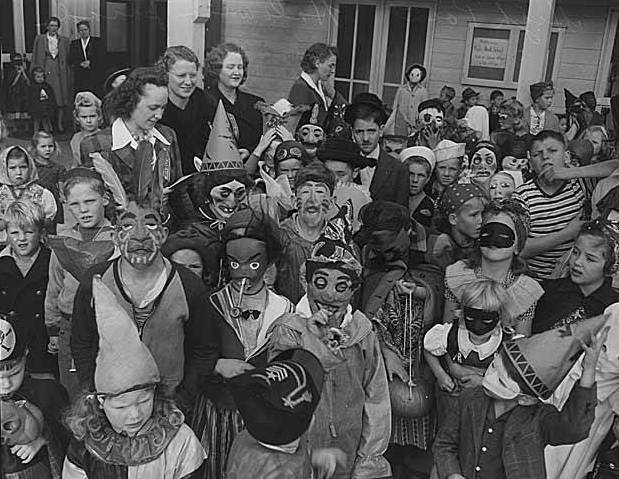 The children were to select their own costumes; the Mayor had stipulated that. It was to be a children's ball in every sense of the word. So they decided to be fairies and shepherdesses, and princesses according to their own fancies; and this new Costumer had charming costumes to suit them. It was noticeable that, for the most part, the children of the rich, who had always had everything they desired, would choose the parts of goose-girls and peasants and such like; and the poor children jumped eagerly at the chance of being princesses or fairies for a few hours in their miserable lives. When Christmas Eve came and the children flocked into the Mayor's mansion, whether it was owing to the Costumer's art, or their own adaptation to the characters they had chosen, it was wonderful how lifelike their representations were. Those little fairies in their short skirts of silken gauze, in which golden sparkles appeared as they moved with their little funny gossamer wings, like butterflies, looked like real fairies. It did not seem possible, when they floated around to the music, half supported on the tips of their dainty toes, half by their filmy purple wings, their delicate bodies swaying in time, that they could be anything but fairies. It seemed absurd to imagine that they were Johnny Mullens, the washerwoman's son, and Polly Flinders, the charwoman's little girl, and so on. The Mayor's daughter, who had chosen the character of a goose-girl, looked so like a true one that one could hardly dream she ever was anything else. She was, ordinarily, a slender, dainty little lady rather tall for her age. She now looked very short and stubbed and brown, just as if she had been accustomed to tend geese in all sorts of weather. It was so with all the others—the Red Riding-hoods, the princesses, the Bo-Peeps and with every one of the characters who came to the Mayor's ball; Red Riding-hood looked round, with big, frightened eyes, all ready to spy the wolf, and carried her little pat of butter and pot of honey gingerly in her basket; Bo-Peep's eyes looked red with weeping for the loss of her sheep; and the princesses swept about so grandly in their splendid brocaded trains, and held their crowned heads so high that people half-believed them to be true princesses. But there never was anything like the fun at the Mayor's Christmas ball. The fiddlers fiddled and fiddled, and the children danced and danced on the beautiful waxed floors. The Mayor, with his family and a few grand guests, sat on a dais covered with blue velvet at one end of the dancing hall, and watched the sport. They were all delighted. The Mayor's eldest daughter sat in front and clapped her little soft white hands. She was a tall, beautiful young maiden, and wore a white dress, and a little cap woven of blue violets on her yellow hair. Her name was Violetta. The supper was served at midnight—and such a supper! The mountains of pink and white ices, and the cakes with sugar castles and flower gardens on the tops of them, and the charming shapes of gold and ruby-coloured jellies. There were wonderful bonbons which even the Mayor's daughter did not have every day; and all sorts of fruits, fresh and candied. They had cowslip wine in green glasses, and elderberry wine in red, and they drank each other's health. The glasses held a thimbleful each; the Mayor's wife thought that was all the wine they ought to have. Under each child's plate there was a pretty present and every one had a basket of bonbons and cake to carry home. At four o'clock the fiddlers put up their fiddles and the children went home; fairies and shepherdesses and pages and princesses all jabbering gleefully about the splendid time they had had. But in a short time what consternation there was throughout the city. When the proud and fond parents attempted to unbutton their children's dresses, in order to prepare them for bed, not a single costume would come off. The buttons buttoned again as fast as they were unbuttoned; even if they pulled out a pin, in it would slip again in a twinkling; and when a string was untied it tied itself up again into a bowknot. The parents were dreadfully frightened. But the children were so tired out they finally let them go to bed in their fancy costumes and thought perhaps they would come off better in the morning. So Red Riding-hood went to bed in her little red cloak holding fast to her basket full of dainties for her grandmother, and Bo-Peep slept with her crook in her hand. The children all went to bed readily enough, they were so very tired, even though they had to go in this strange array. All but the fairies—they danced and pirouetted and would not be still. "We want to swing on the blades of grass," they kept saying, "and play hide and seek in the lily cups, and take a nap between the leaves of the roses." The poor charwomen and coal-heavers, whose children the fairies were for the most part, stared at them in great distress. They did not know what to do with these radiant, frisky little creatures into which their Johnnys and their Pollys and Betseys were so suddenly transformed. But the fairies went to bed quietly enough when daylight came, and were soon fast asleep. There was no further trouble till twelve o'clock, when all the children woke up. Then a great wave of alarm spread over the city. Not one of the costumes would come off then. The buttons buttoned as fast as they were unbuttoned; the pins quilted themselves in as fast as they were pulled out; and the strings flew round like lightning and twisted themselves into bow-knots as fast as they were untied. And that was not the worst of it; every one of the children seemed to have become, in reality, the character which he or she had assumed. The Mayor's daughter declared she was going to tend her geese out in the pasture, and the shepherdesses sprang out of their little beds of down, throwing aside their silken quilts, and cried that they must go out and watch their sheep. The princesses jumped up from their straw pallets, and wanted to go to court; and all the rest of them likewise. Poor little Red Riding-hood sobbed and sobbed because she couldn't go and carry her basket to her grandmother, and as she didn't have any grandmother she couldn't go, of course, and her parents were very much doubled. It was all so mysterious and dreadful. The news spread very rapidly over the city, and soon a great crowd gathered around the new Costumer's shop for every one thought he must be responsible for all this mischief. The shop door was locked; but they soon battered it down with stones. When they rushed in the Costumer was not there; he had disappeared with all his wares. Then they did not know what to do. But it was evident that they must do something before long for the state of affairs was growing worse and worse. The Mayor's little daughter braced her back up against the tapestried wall, and planted her two feet in their thick shoes firmly. "I will go and tend my geese," she kept crying. "I won't eat my breakfast. I won't go out in the park. I won't go to school. I'm going to tend my geese—I will, I will, I will!" And the princesses trailed their rich trains over the rough unpainted floors in their parents' poor little huts, and held their crowned heads very high and demanded to be taken to court. The princesses were mostly geese-girls when they were their proper selves, and their geese were suffering, and their poor parents did not know what they were going to do and they wrung their hands and wept as they gazed on their gorgeously apparelled children. Finally the Mayor called a meeting of the Aldermen, and they all assembled in the City Hall. Nearly every one of them had a son or a daughter who was a chimney-sweep, or a little watch-girl, or a shepherdess. They appointed a chairman and they took a great many votes and contrary votes but they did not agree on anything, until every one proposed that they consult the Wise Woman. Then they all held up their hands, and voted to, unanimously. So the whole board of Aldermen set out, walking by twos, with the Mayor at their head, to consult the Wise Woman. The Aldermen were all very fleshy, and carried gold-headed canes which they swung very high at every step. They held their heads well back, and their chins stiff, and whenever they met common people they sniffed gently. They were very imposing. The Wise Woman lived in a little hut on the outskirts of the city. She kept a Black Cat, except for her, she was all alone. She was very old, and had brought up a great many children, and she was considered remarkably wise. But when the Aldermen reached her hut and found her seated by the fire, holding her Black Cat, a new difficulty presented itself. She had always been quite deaf and people had been obliged to scream as loud as they could in order to make her hear; but lately she had grown much deafer, and when the Aldermen attempted to lay the case before her she could not hear a word. In fact, she was so very deaf that she could not distinguish a tone below G-sharp. The Aldermen screamed till they were quite red in the faces, but all to no purpose: none of them could get up to G-sharp of course. So the Aldermen all went back, swinging their gold-headed canes, and they had another meeting in the City Hall. Then they decided to send the highest Soprano Singer in the church choir to the Wise Woman; she could sing up to G-sharp just as easy as not. So the high Soprano Singer set out for the Wise Woman's in the Mayor's coach, and the Aldermen marched behind, swinging their gold-headed canes. The High Soprano Singer put her head down close to the Wise Woman's ear, and sung all about the Christmas Masquerade and the dreadful dilemma everybody was in, in G-sharp—she even went higher, sometimes, and the Wise Woman heard every word. She nodded three times, and every time she nodded she looked wiser. "Go home, and give 'em a spoonful of castor-oil, all 'round," she piped up; then she took a pinch of snuff, and wouldn't say any more. So the Aldermen went home, and every one took a district and marched through it, with a servant carrying an immense bowl and spoon, and every child had to take a dose of castor-oil. But it didn't do a bit of good. The children cried and struggled when they were forced to take the castor-oil; but, two minutes afterward, the chimney-sweeps were crying for their brooms, and the princesses screaming because they couldn't go to court, and the Mayor's daughter, who had been given a double dose, cried louder and more sturdily: "I want to go and tend my geese. I will go and tend my geese." So the Aldermen took the high Soprano Singer, and they consulted the Wise Woman again. She was taking a nap this time, and the Singer had to sing up to B-flat before she could wake her. Then she was very cross and the Black Cat put up his back and spit at the Aldermen. "Give 'em a spanking all 'round," she snapped out, "and if that don't work put 'em to bed without their supper." Then the Aldermen marched back to try that; and all the children in the city were spanked, and when that didn't do any good they were put to bed without any supper. But the next morning when they woke up they were worse than ever. The Mayor and Aldermen were very indignant, and considered that they had been imposed upon and insulted. So they set out for the Wise Woman again, with the high Soprano Singer. She sang in G-sharp how the Aldermen and the Mayor considered her an impostor, and did not think she was wise at all, and they wished her to take her Black Cat and move beyond the limits of the city. She sang it beautifully; it sounded like the very finest Italian opera music. "Deary me," piped the Wise Woman, when she had finished, "how very grand these gentlemen are." Her Black Cat put up his back and spit. "Five times one Black Cat are five Black Cats," said the Wise Woman. And directly there were five Black Cats spitting and miauling. "Five times five Black Cats are twenty-five Black Cats." And then there were twenty-five of the angry little beasts. "Five times twenty-five Black Cats are one hundred and twenty-five Black Cats," added the Wise Woman with a chuckle. Then the Mayor and the Aldermen and the high Soprano Singer fled precipitately out the door and back to the city. One hundred and twenty-five Black Cats had seemed to fill the Wise Woman's hut full, and when they all spit and miauled together it was dreadful. The visitors could not wait for her to multiply Black Cats any longer. As winter wore on and spring came, the condition of things grew more intolerable. Physicians had been consulted, who advised that the children should be allowed to follow their own bents, for fear of injury to their constitutions. So the rich Aldermen's daughters were actually out in the fields herding sheep, and their sons sweeping chimneys or carrying newspapers; and while the poor charwomen's and coal-heavers, children spent their time like princesses and fairies. Such a topsy-turvy state of society was shocking. While the Mayor's little daughter was tending geese out in the meadow like any common goose-girl, her pretty elder sister, Violetta, felt very sad about it and used often to cast about in her mind for some way of relief. When cherries were ripe in spring, Violetta thought she would ask the Cherry-man about it. She thought the Cherry-man quite wise. He was a very pretty young fellow, and he brought cherries to sell in graceful little straw baskets lined with moss. So she stood in the kitchen door one morning and told him all about the great trouble that had come upon the city. He listened in great astonishment; he had never heard of it before. He lived several miles out in the country. "How did the Costumer look?" he asked respectfully; he thought Violetta the most beautiful lady on earth. Then Violetta described the Costumer, and told him of the unavailing attempts that had been made to find him. There were a great many detectives out, constantly at work. "I know where he is!" said the Cherry-man. "He's up in one of my cherry-trees. He's been living there ever since cherries were ripe, and he won't come down." Then Violetta ran and told her father in great excitement, and he at once called a meeting of the Aldermen, and in a few hours half the city was on the road to the Cherry-man's. He had a beautiful orchard of cherry-trees all laden with fruit. And, sure enough in one of the largest, way up amongst the topmost branches, sat the Costumer in his red velvet and short clothes and his diamond knee-buckles. He looked down between the green boughs. "Good-morning, friends!" he shouted. The Aldermen shook their gold-headed canes at him, and the people danced round the tree in a rage. Then they began to climb. But they soon found that to be impossible. As fast as they touched a hand or foot to a tree, back it flew with a jerk exactly as if the tree pushed it. They tried a ladder, but the ladder fell back the moment it touched the tree, and lay sprawling upon the ground. Finally, they brought axes and thought they could chop the tree down, Costumer and all; but the wood resisted the axes as if it were iron, and only dented them, receiving no impression itself. Meanwhile, the Costumer sat up in the tree, eating cherries and throwing the stones down. Finally he stood up on a stout branch, and, looking down, addressed the people. "It's of no use, your trying to accomplish anything in this way," said he; "you'd better parley. I'm willing to come to terms with you, and make everything right on two conditions." The people grew quiet then, and the Mayor stepped forward as spokesman, "Name your two conditions," said he rather testily. "You own, tacitly, that you are the cause of all this trouble." "Well" said the Costumer, reaching out for a handful of cherries, "this Christmas Masquerade of yours was a beautiful idea; but you wouldn't do it every year, and your successors might not do it at all. I want those poor children to have a Christmas every year. My first condition is that every poor child in the city hangs its stocking for gifts in the City Hall on every Christmas Eve, and gets it filled, too. I want the resolution filed and put away in the city archives." "We agree to the first condition!" cried the people with one voice, without waiting for the Mayor and Aldermen. "The second condition," said the Costumer, "is that this good young Cherry-man here has the Mayor's daughter, Violetta, for his wife. He has been kind to me, letting me live in his cherry-tree and eat his cherries and I want to reward him." "We consent," cried all the people; but the Mayor, though he was so generous, was a proud man. "I will not consent to the second condition," he cried angrily. "Very well," replied the Costumer, picking some more cherries, "then your youngest daughter tends geese the rest of her life, that's all." The Mayor was in great distress; but the thought of his youngest daughter being a goose-girl all her life was too much for him. He gave in at last. "Now go home and take the costumes off your children," said the Costumer, "and leave me in peace to eat cherries." Then the people hastened back to the city, and found, to their great delight, that the costumes would come off. The pins stayed out, the buttons stayed unbuttoned, and the strings stayed untied. The children were dressed in their own proper clothes and were their own proper selves once more. The shepherdesses and the chimney-sweeps came home, and were washed and dressed in silks and velvets, and went to embroidering and playing lawn-tennis. And the princesses and the fairies put on their own suitable dresses, and went about their useful employments. There was great rejoicing in every home. Violetta thought she had never been so happy, now that her dear little sister was no longer a goose-girl, but her own dainty little lady-self. The resolution to provide every poor child in the city with a stocking full of gifts on Christmas was solemnly filed, and deposited in the city archives, and was never broken. Violetta was married to the Cherry-man, and all the children came to the wedding, and strewed flowers in her path till her feet were quite hidden in them. The Costumer had mysteriously disappeared from the cherry-tree the night before, but he left at the foot some beautiful wedding presents for the bride—a silver service with a pattern of cherries engraved on it, and a set of china with cherries on it, in hand painting, and a white satin robe, embroidered with cherries down the front. The Christmas Masquerade is a featured selection in our collection of Christmas Stories. It is also appropriate before Halloween, to encourage careful costume selections! Add The Christmas Masquerade to your own personal library.